Bling Is A Girls Best Friend! Good morning blogging friends! It seems like once Spring rolls around the wedding bells start ringing so I thought I would get a head start on wedding cards and I have one to share with you today. 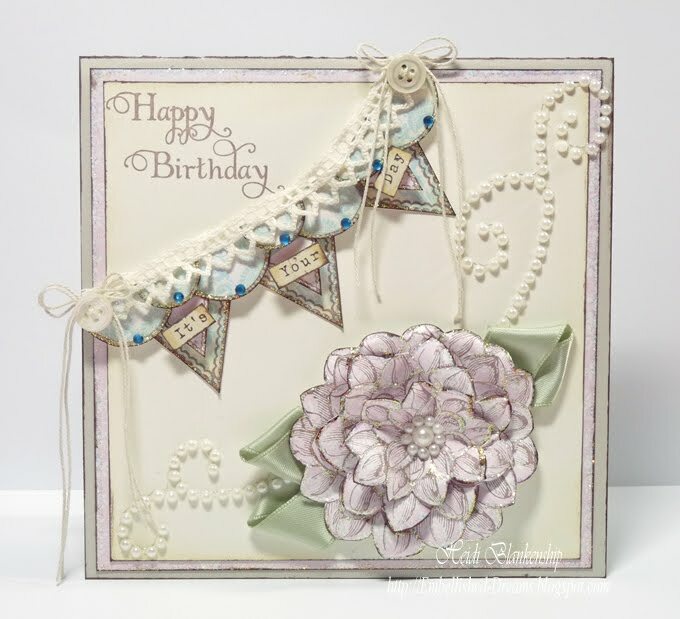 My card is also featured on the Want2Scrap Blog today! 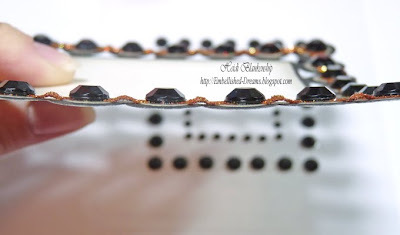 I think I am in love with the Black Rhinestone Nestabling™!! How gorgeous is that? I know sometimes people are afraid to use the color black in their card designs, afraid it might make the card too dark but I think using black for accents gives it just the right touch of richness and elegance. 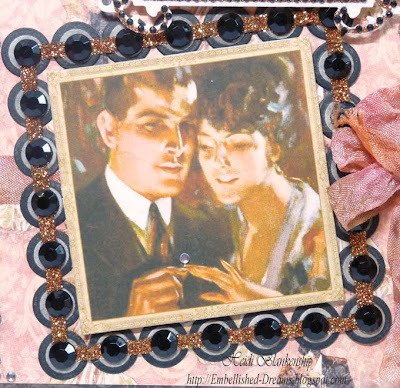 I used Nestabling™ Beaded Square Black Rhinestone, Nestabling™ Fancy Tags Two Black Rhinestone and Silver Baby Bling on the wedding card. 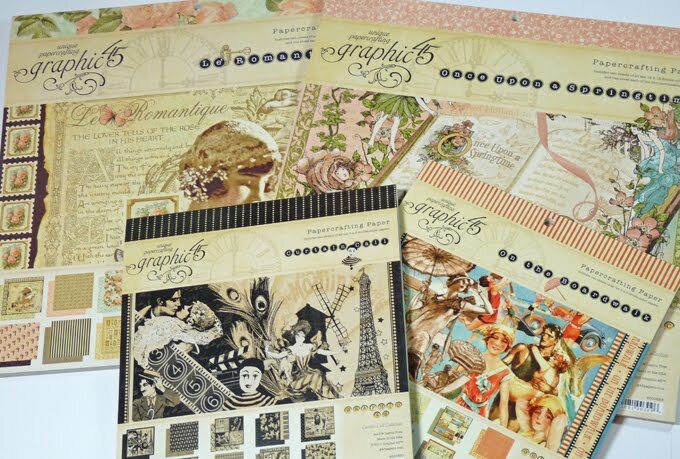 The beautiful designer paper is from Graphic 45 Le' Romantique Collection. To start I wanted to do the Reverse Stencil Technique on the S4-315 Beaded Squares die template from Spellbinders™. I used Black Color Box Chalk Ink and inked directly on the inside of the die template and then used the Grand Calibur™ to cut/emboss. 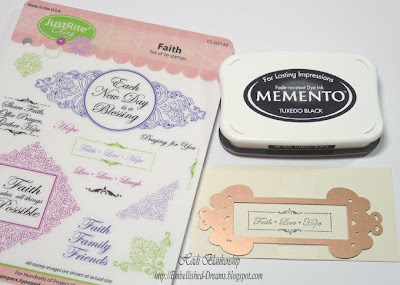 Next I used a stamp from the Faith stamp set from JustRite Stampers, Tuxedo Black ink and stamped the sentiment on to Simply Smooth Ivory cardstock. 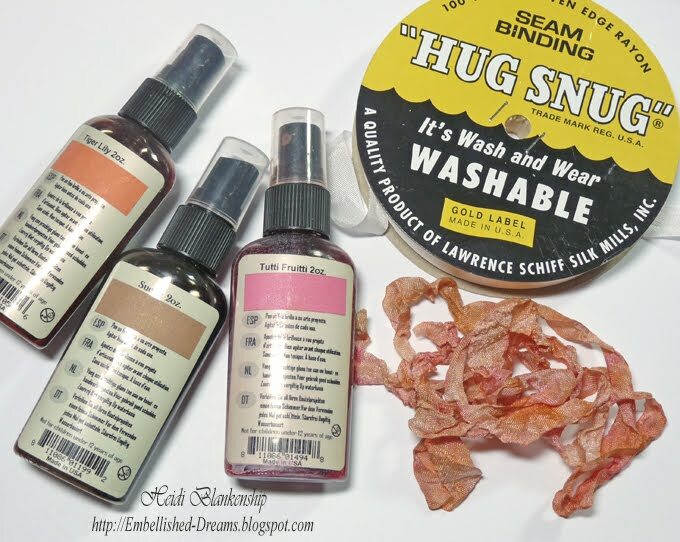 I used S5-030 Fancy Tags Two and the Grand Calibur™ to cut/emboss the tag. 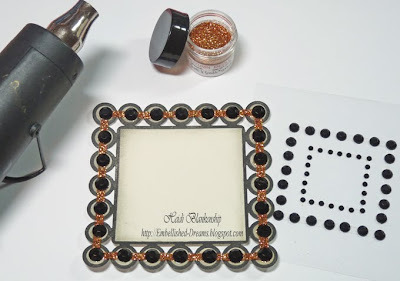 Before removing the cardstock from S4-315 Beaded Squares I used the die template as a stencil and inked the diecut with Antique Linen Distress Ink. 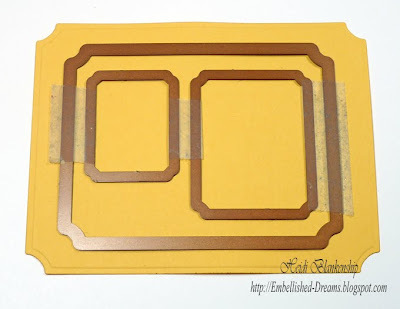 The black edging on the diecut is the results from the Reverse Stenciling Technique. 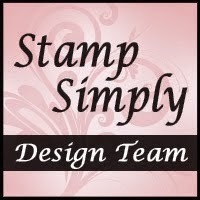 For the image of the Groom and Bride I used S4-126 Classic Squares Large #6 to cut/emboss the square. I also used the die template as a stencil for the tag and inked the inside edges with Antique Linen. I used Nestabling™ Beaded Square Black Rhinestone to edge the diecut. Next I tried something a little different--I very carefully used a heat tool on the exposed adhesive part on the Nestabling™ and it created a wavy ribbon look to the adhesive and made it tacky to apply and hold glitter. Here is a close up. 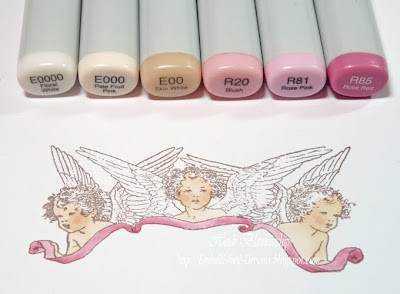 I think it's kind of neat looking and it adds just a little more texture and dimension. 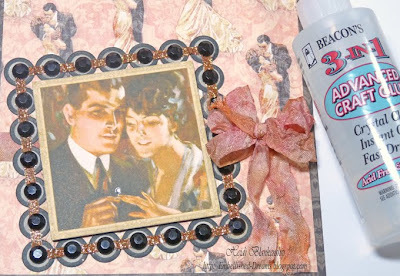 I used Autumn Medley Glitter from Sparkle N Sprinkle. 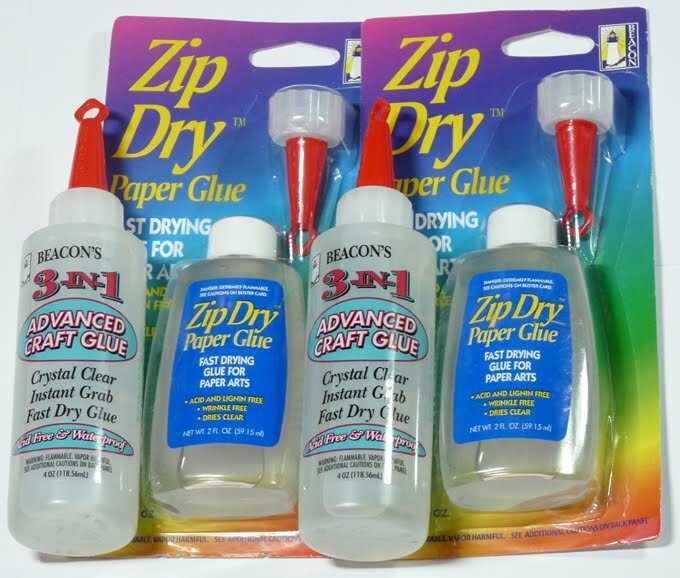 Now, if you are going to try this please be very careful and don't hold the heat tool on the adhesive part for too long or it will melt. It only takes a few seconds to get this effect. Here is a close up of the finished piece. I also added one little Silver Baby Bling for the ring. ;-) Next I added Nestabling™ Fancy Tags Two Black Rhinestone and a couple Silver Baby Bling to the tag and then I added some of the same glitter as mentioned above. Here is a close up of the tag. I didn't have any ribbon to match the Graphic 45 paper so I hand tinted and crinkled some seam binding using three shades of Glimmer Mist from Tattered Angels. To adhere the diecut and the bow I used 3-in1 Advanced Craft Glue from Beacon Adhesives. Here is a close up of the bow and the Trinket Pins from Maya Road. Thank you so much for stopping by today!! 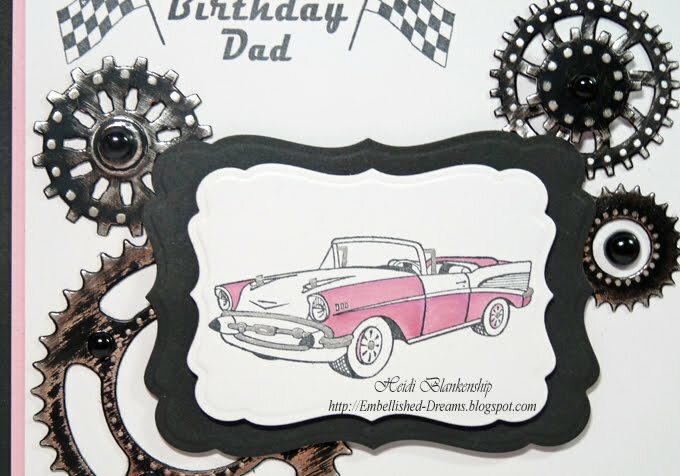 Don't forget to check out the Want2Scrap Blog and I hope you have a creative day!! Hello! Today, I have a birthday card to share with you. 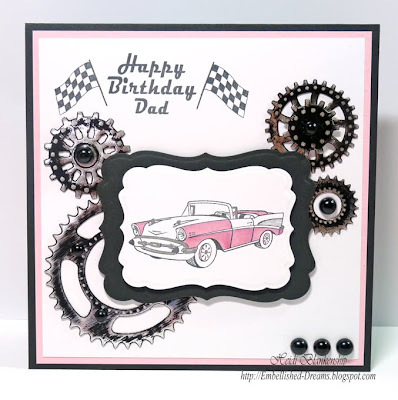 This is the birthday card that I made for my Dad, his birthday was last week. 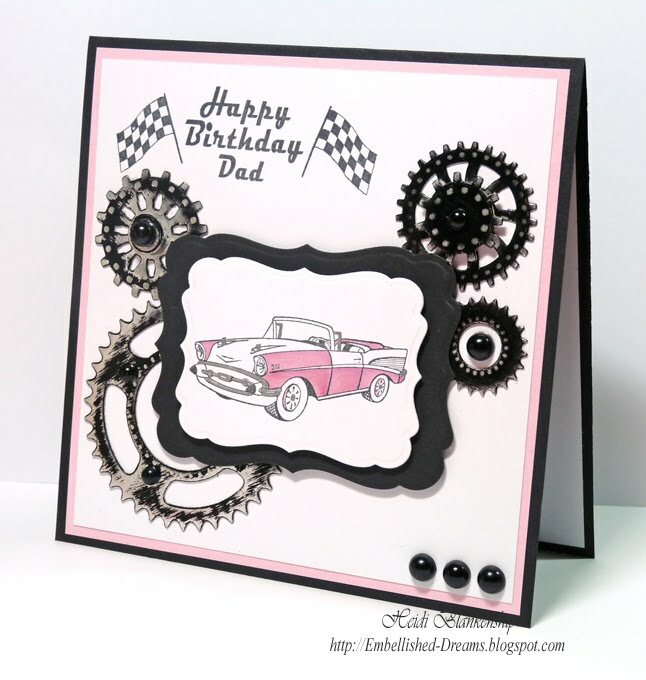 I used Car Classics stamp set from Crafty Secrets for the image of the car, flags and sentiment. 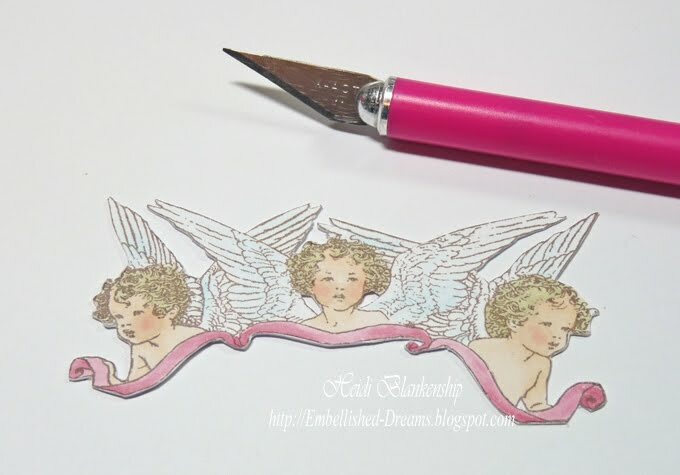 This is a great stamp set to use when making masculine cards! I stamped the image of the car onto Simply Smooth White cardstock from Discount Cardstock using Tuxedo Black ink. Then I added color using Copic Markers. For the silver trim I used a Silver Metallic Pen from Sakura. To create the die cuts I used the Grand Calibur™ and S5-025 Labels Seventeen 3, 4 from Spellbinders™ to cut/emboss. I stamped the sentiment and the two flags at the top using Tuxedo Black ink. To create the sprockets I used the Grand Calibur™ and S5-048 Sprightly Sprockets from Spellbinders™ with Silver Etching Foil. 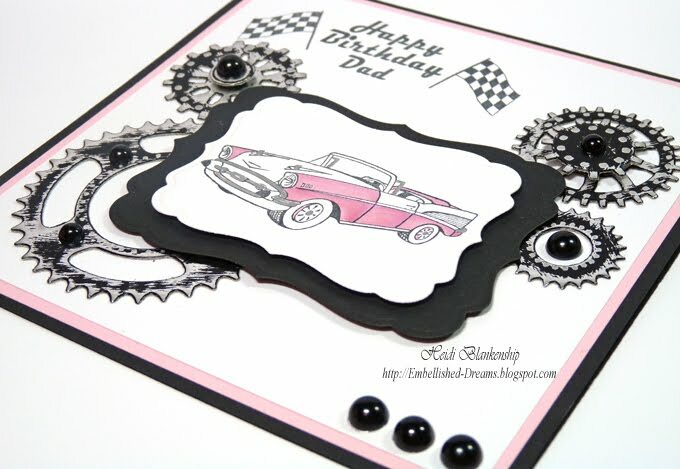 For the mat and base of the card I used Soot and Frosted Pink Prismatic cardstock from Discount Cardstock. 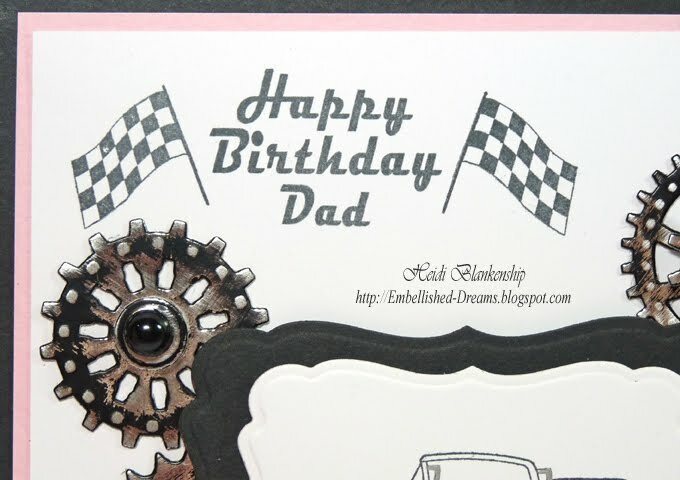 As finishing touch I added some Black Pearls from Want2Scrap on the sprockets and at the bottom of the card. Hello! 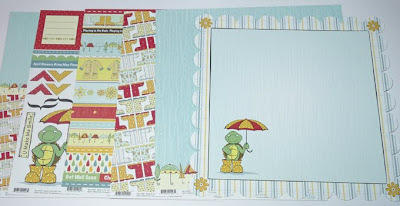 Today, I have a layout to share with you that was part of a make-n-take I did a couple of weeks ago at VIP Scrapbook in Rochester. 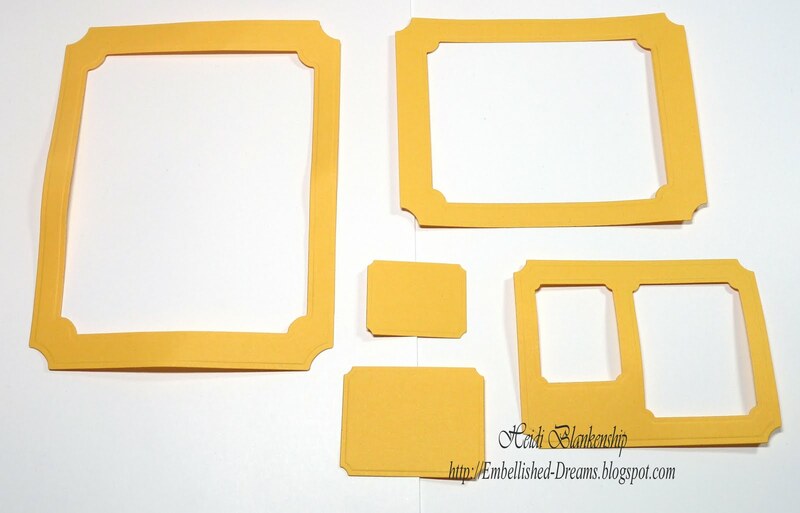 For the make-n-take I shared how you can take the Grand Dies from Spellbinders™ and create frames and journaling blocks for your layouts. 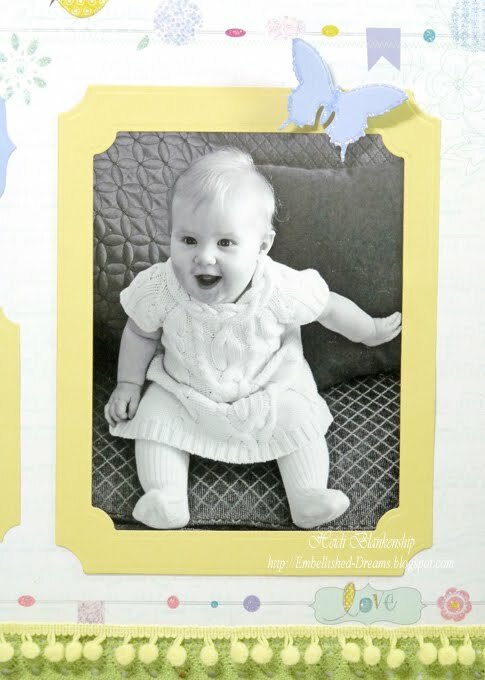 I have to say a huge Thank You to my cousin Dani for letting me use the photos of her sweet little girl!! 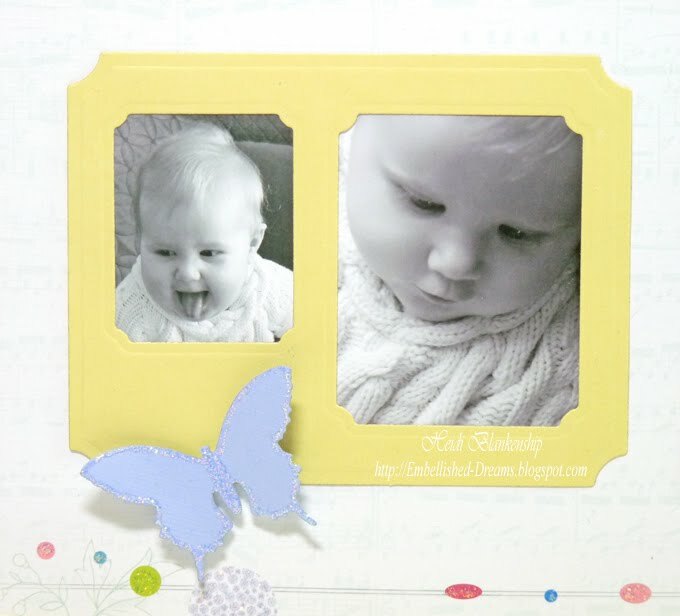 This layout is a very simple one compared to the layouts I usually create but I was going for simplicity and I wanted the frames to be the main focus of the layout in addition to the sweet photos. To create the largest frame I used LF-168 Grand Large Labels #3 and #5. 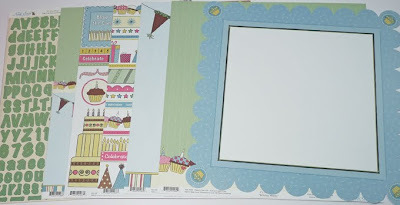 I taped the two die templates together and used the Grand Calibur™ to cut/emboss the two pieces. Next I took the drop out piece from the large frame and taped three die templates together to create the smaller frame. 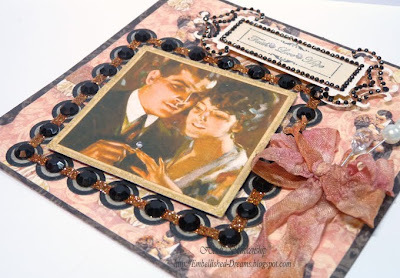 I used LF-168 Grand Large Labels #1 and S4-168 Large Labels #2 and #3. Then I used the Grand Calibur™ to cut/emboss all the pieces. 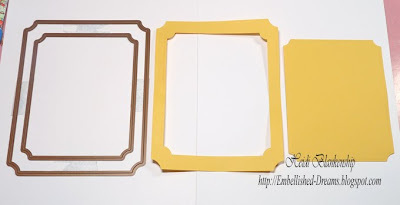 Here are the results three frames and two pieces that could be used as journal blocks, mats for photos or as an embellishment. I didn't use all of the pieces on the layout but I wanted to show how easy it is to create perfect looking frames using the Grand Dies from Spellbinders™. I used chipboard letters from My Mind's Eye Lush Line and added Green Stickles and added them to a label. 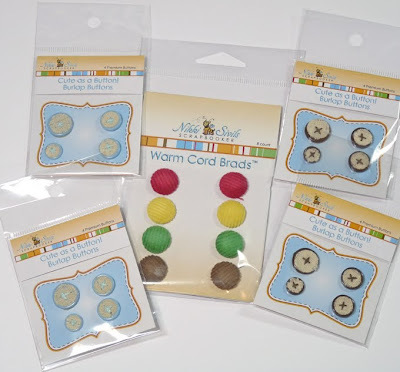 To create the label I used S4-309 Labels Four Small #5. For the butterflies I used S5-051 Fanciful Flight. 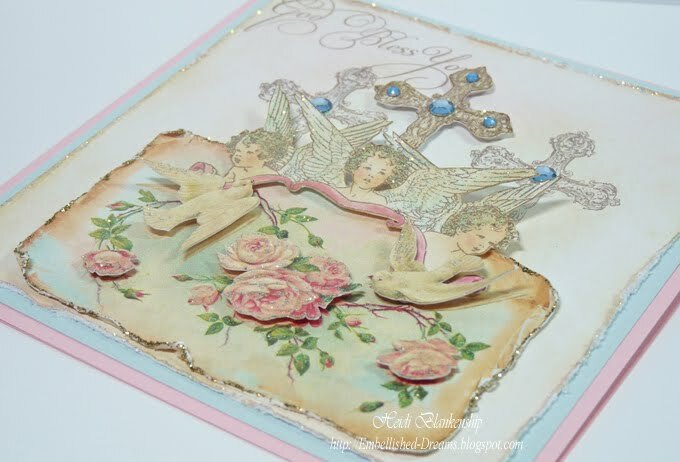 For a finishing touch I added diamond stickles to the butterflies and some of the images on the paper. I also added some green lace trim and yellow pom pom trim to the bottom. 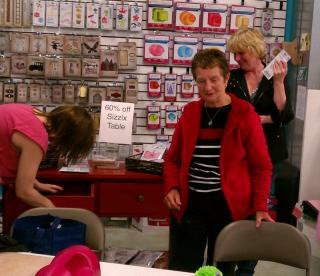 I want to say a Huge Thank You to VIP Scrapbook in Rochester for having me come to teach classes for their Die Extravaganza Day!! I had a wonderful time and met so many sweet ladies!! 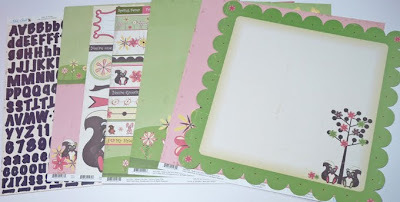 If you are in the area you should stop in and check out the VIP Scrapbook Store--it is a beautiful store filled with SO many paper crafting goodies!!! 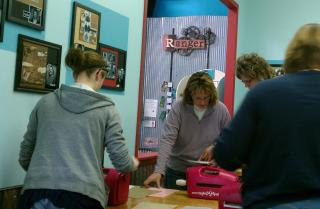 I have a few photos to share from the event--thank you Kathy for the photos!! I took my camera with and got so busy with the classes I completely forgot to get it out and take any pictures!! One of the classes. Some of the artwork I took with for display. 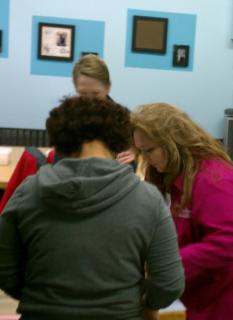 A couple more pictures from a class. 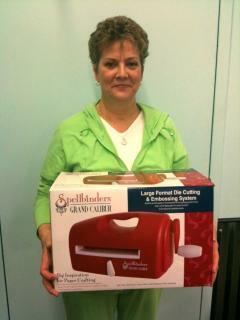 Grand Prize Winner!!! Hello and good morning! Did you all have a wonderful holiday weekend? I sure hope so!! 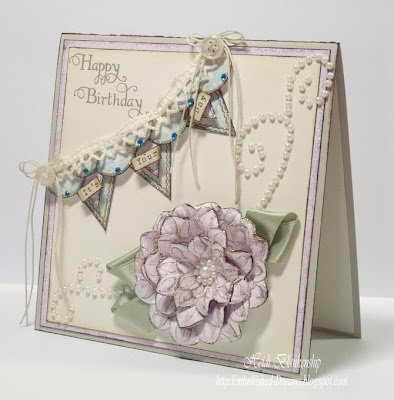 Today is the Crafty Secrets DT Challenge and the theme for this challenge is paper piecing. We could use any of the Crafty Secrets stamp sets and solid colored or printed paper. Here is the card that I designed. 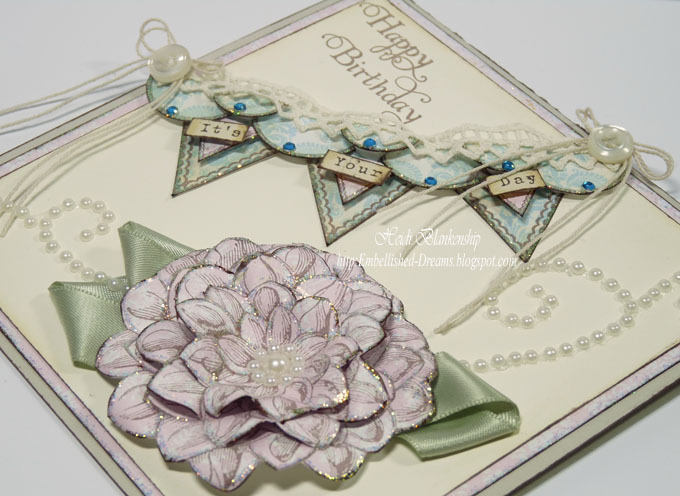 I used some of the New Craft Secrets CD Papers to create my project. I used the Blue Damask and Sandra Damask (pink) to create my flower and banner on the card. For the flower I used a stamp image from the Dahlia stamp set and stamped it three times with Rich Cocoa ink on to the Sandra Damask Paper. 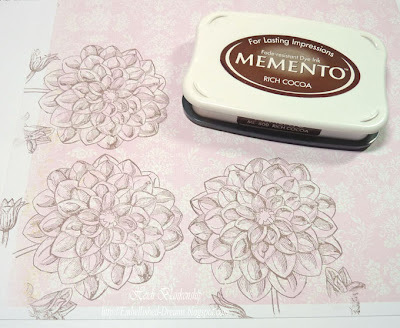 Then I hand cut the images having each one a little smaller so I could layer the flower. Here is a close up of the dahlia flower. 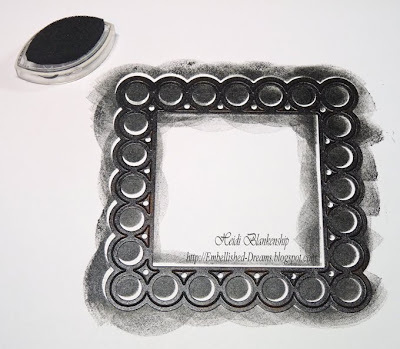 I inked the edges with Rich Cocoa ink and then added White Pearls from Want2Scrap to the center and Diamond Stickles to the edges. For layering the flower I used 3-in-1 Advanced Craft Glue from Beacon Adhesives. I used folded pieces of light green ribbon to create the leave. 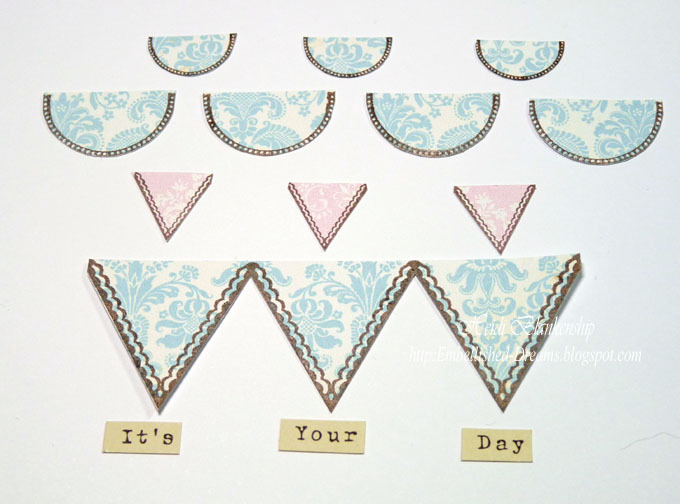 To create the banner I used Blue Damask and Sandra Damask (pink) from the Crafty Secrets CD Papers and stamped the banner pieces using stamps from the Artsy Banner stamp set. I hand cut each piece and the word blocks are from Crafty Secrets Altered Fairies Creative Scraps. Here is a close up of the banner once it was all pieced together. 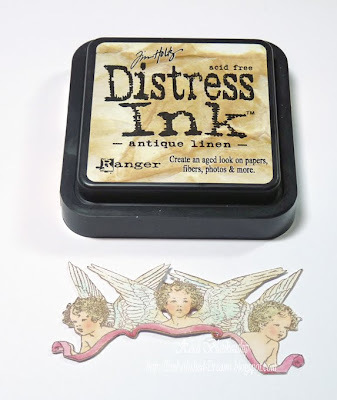 I inked the edges of the Blue Damask pieces with Antique Linen and then I inked all of the pieces with Rich Cocoa ink and edged the pieces with Diamond Stickles. I used 3D Foam Squares for the layering. 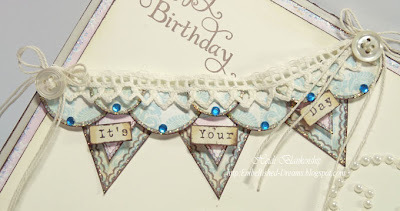 To finish off the banner I used a piece of vintage lace trim and some Turquoise Baby Bling from Want2Scrap and a couple of buttons. 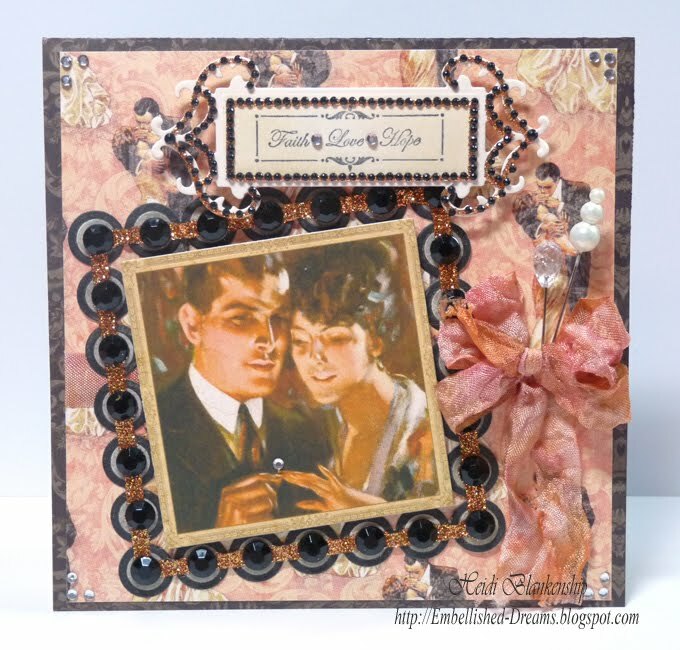 I love all of the dimension from the layers! 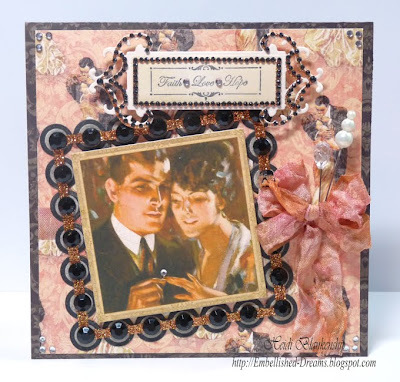 The sentiment is from the Glamour Girls stamp set. 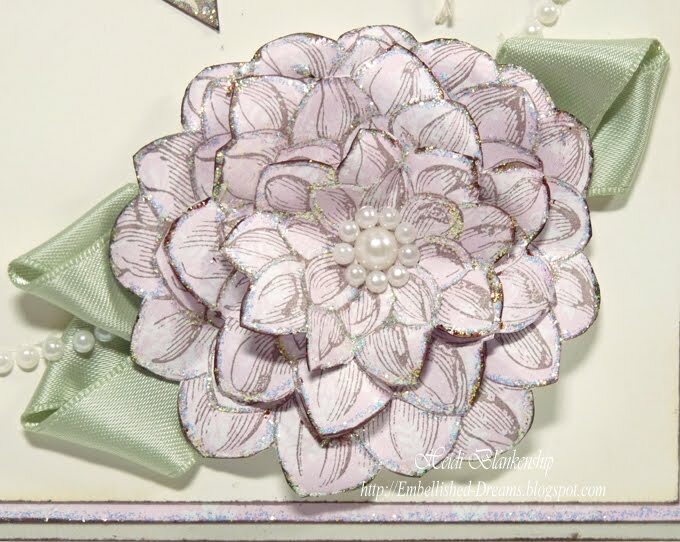 For a finishing touch I added White Pearl Swirls on each side of the dahlia from Want2Scrap. I can't wait to see what the other girls have been busy creating!! Here is a link list so you can visit each of their blogs. 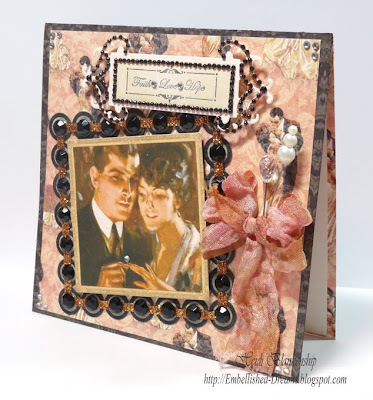 Sophie La Fontaine is the Guest Designer for April for Crafty Secrets. 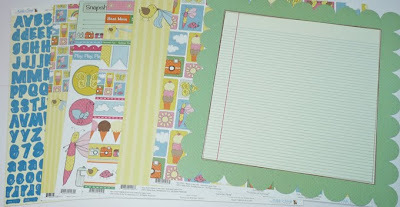 Sophie doesn't happen to have a blog but you can see her design work on the Crafty Secrets Heartwarming Vintage Blog. Thanks you so much for stopping by today and I hope you have a Fantastic Day!! Crafty Secrets Easter Card--Happy Easter!! 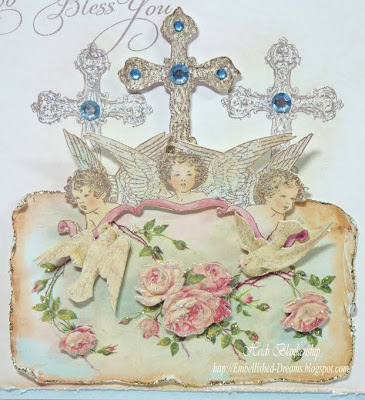 For today I have an Easter card to share with you that I made for my parents. 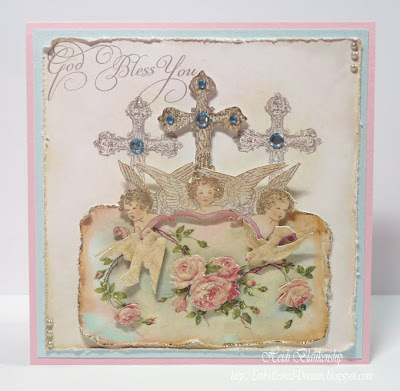 With the sentiment you could actually use this card for several occasions. 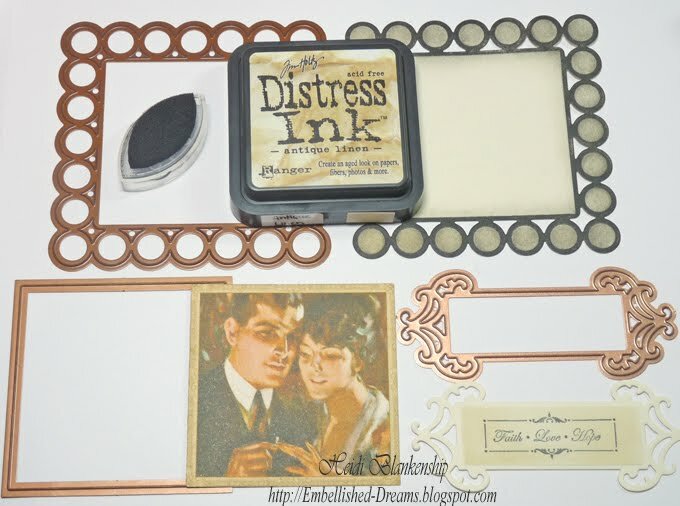 The stamps and the printed images are both from Crafty Secrets. 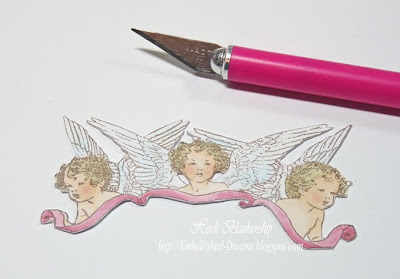 I used the Angel Blessings stamp set and Love Mail Creative Scraps. 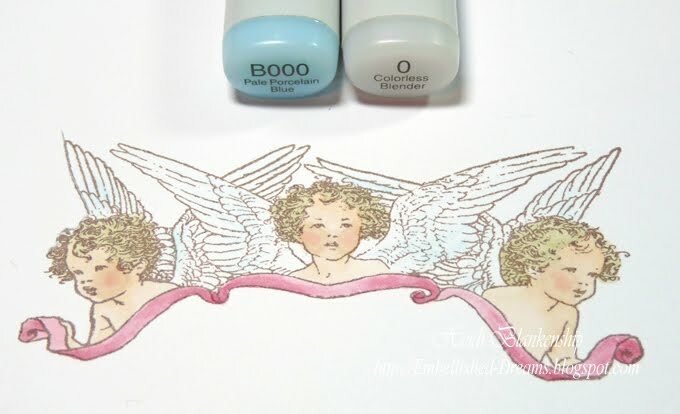 To start I stamped the image of the three little cherubs using Rich Cooca ink and then started to add color to their faces and the ribbon using Copic Markers. Next I added just a little hint of blue to the wings. 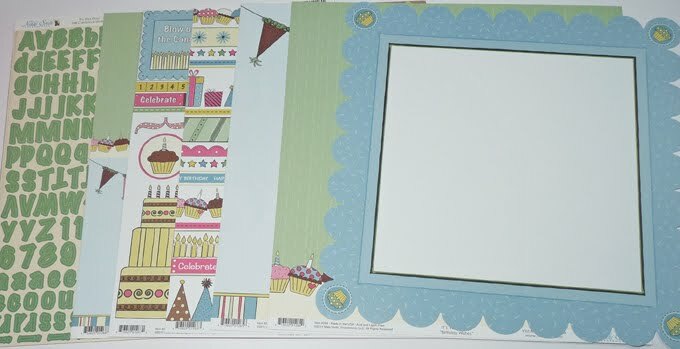 Then I carefully cut the image out using a craft knife. I wanted to try and match the look of the stamped image to the Creative Scraps image so I inked the entire piece with Antique Linen Distress Ink. I used two if the images with the roses and doves from the Love Mail Creative Scraps and layered the roses and the doves. Then I distressed the edges and added the image of the cherubs to the top. For the background paper I stamped the cross two times on to the paper and a third time on a scrap piece of paper and cut out the cross. 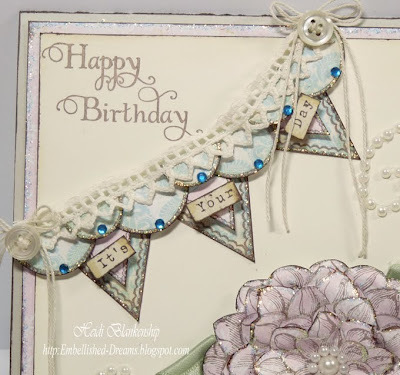 For a little sparkle I added some diamond and gold stickles. I stamped the sentiment in the upper corner and then added some bling from Want2Scrap. 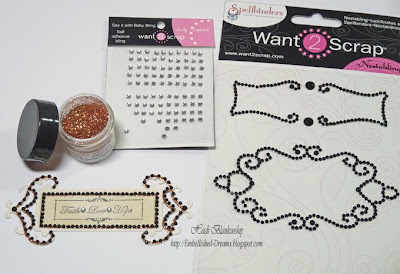 I used Baby Blue Rhinestones and LeCreme Baby Pearls from Want2Scrap. All of the cardstock is from Discount Cardstock. Thank you so much for stopping by today!! 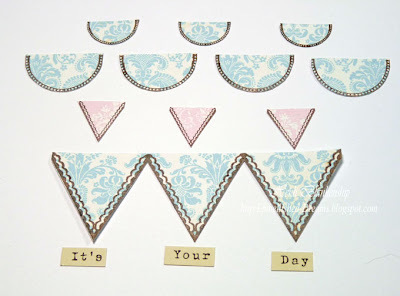 I hope you have a wonderful day and please be sure to stop back tomorrow for the Crafty Secrets monthly challenge! 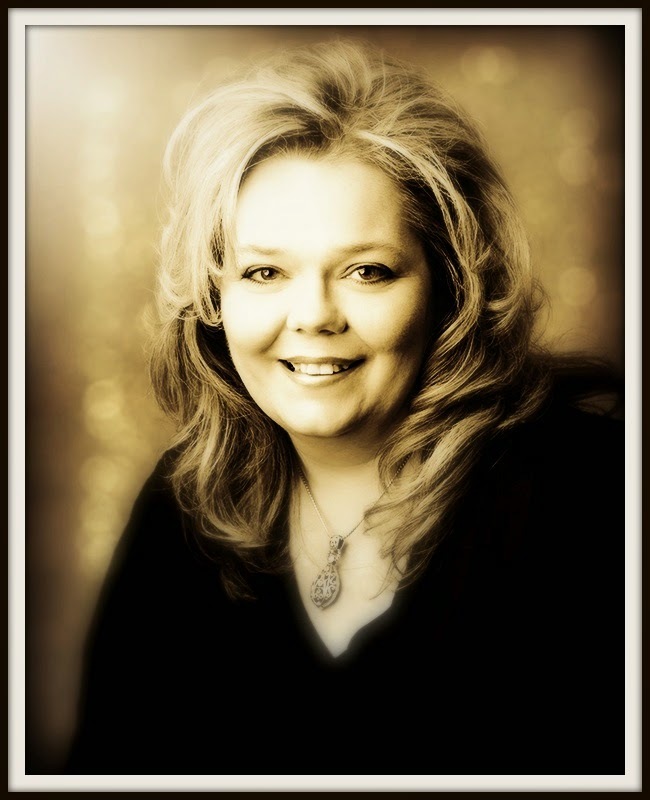 Hello blogging friends! I know it's been a few days since my last post, it was just one of those weeks. 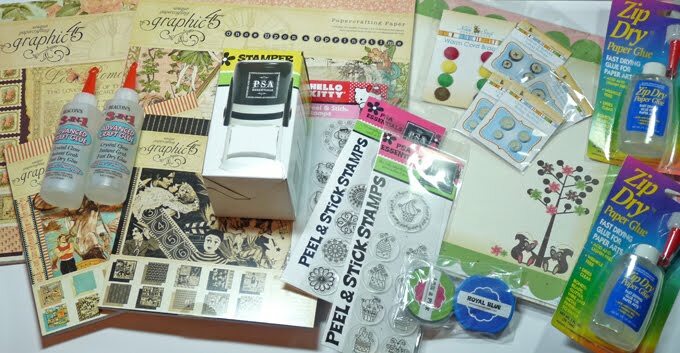 ;-) I don't have any new art to share with you today but I wanted to do a quick post to show you some of the goodies I received in the mail on Friday!! 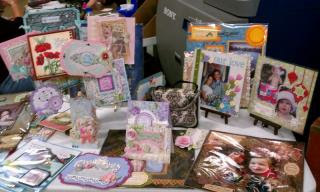 Check out some of the Nestabling™, Pearls and Rhinestones--that's a whole lot of sparkling BLING going on!!! 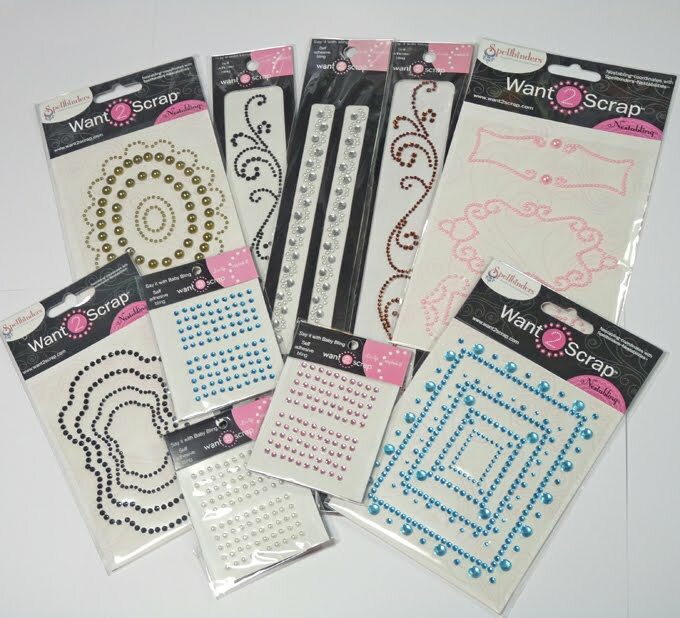 One of the companies I work with, Want2Scrap is Cross Promoting with a few other companies and I want to say a HUGE Thank You to Michele Parrish, owner of Want2Scrap and the following companies--Graphic 45, Beacon Adhesives, Nikki Sivils and PSA Essentials!!! Look at all the goodies!!! 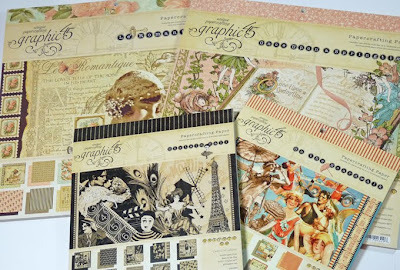 Beautiful paper pads from Graphic45. 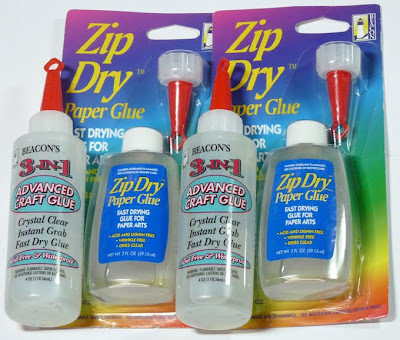 Some of my Favorite liquid adhesives from Beacon Adhesives. 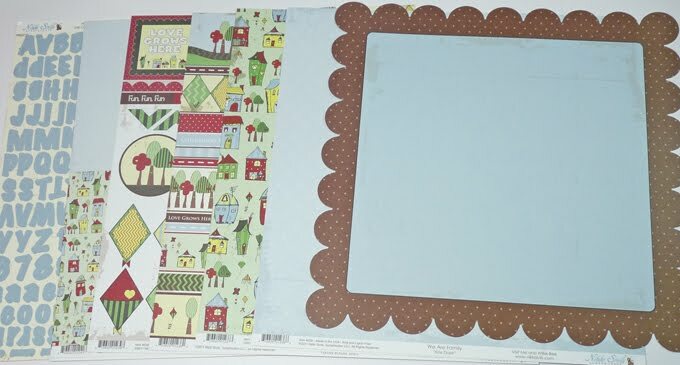 SO Many Fun papers and buttons from Nikki Sivils. 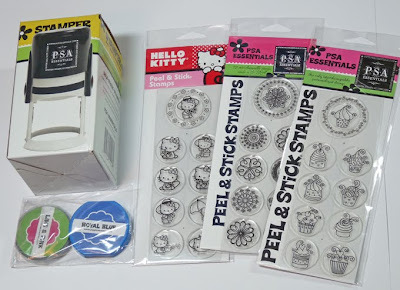 Stamper, Stamps Sets and Inks from PSA Essentials. I can't wait to start creating with all of these fantastic products!! 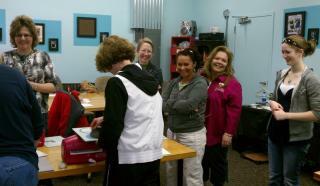 Thanks again to Want2Scrap and all of the wonderful companies!!! On a more personal note I want to say a special Happy Birthday to my Dad!!! Today is his birthday!! I made him a card that I will share a little later in the week. ;-) He was pretty busy today so we didn't get to see him but we are getting together tomorrow so we will be celebrating his birthday and Easter. 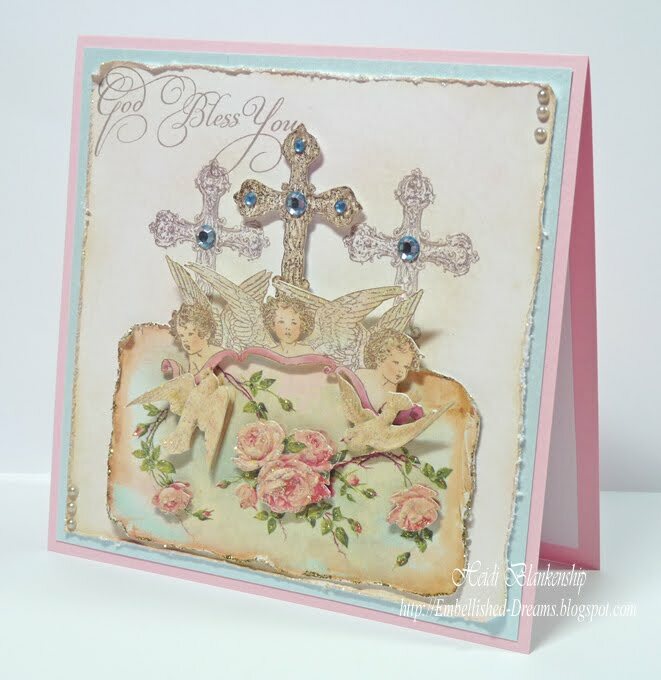 I will be posting a card tomorrow but it won't be for Simply Sunday. With the holiday weekend the girls and I decided to take this weekend off from Simply Sunday and we will start up again next week. Thanks so much for stopping by!! I hope you all have a wonderful and blessed Easter weekend!! !